No matter how old they are, writing letters to Santa is a big thing for my kids and really gets them started on the Christmas chatter. I start telling them in about September to think about what they want but am always reminding then come November that they actually need to write it down or Santa will have no hope of getting them what they want! Most modern video games are now designed to be played online and Skype seems to be the only method of communicating with friends after school (who needs a house phone any more?) which means today’s teens need a really good quality headset with microphone. The Cloud 2 delivers premium quality audio whilst also being designed for comfort, they will be worn a LOT after all so you don’t want their ears being squished! 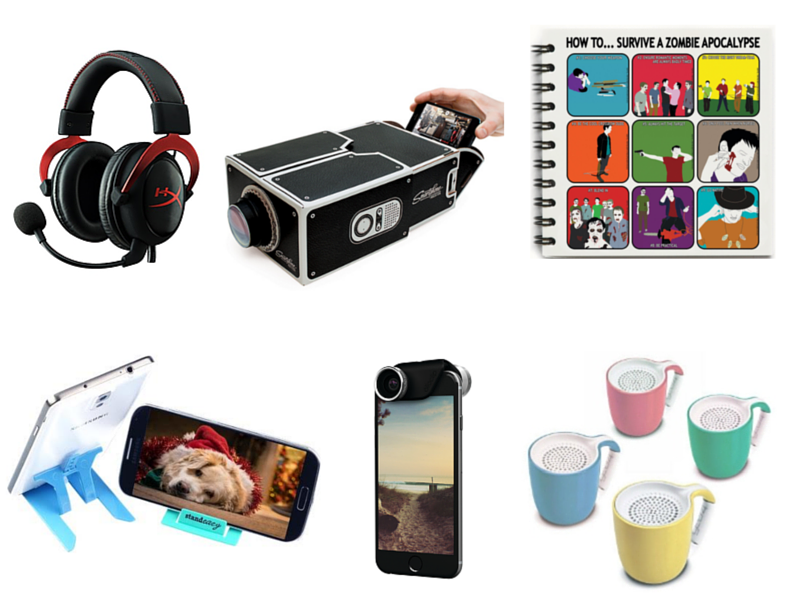 You will never find a teenager far from their phone, at least willingly, so I’m afraid this gift guide is a bit heavy on the phone related objects, but at least they are items they will actually use. I love this projector, its such a simple way for teenagers to share their images and videos with a group of friends without them all having to cram around a 4″ screen! My girls love stationery but quite often notepads are very girly, which they are not fans of, plus I expect it is quite difficult to get funky notepads that will be suitable for the boys to take to school. Two Little Boys have completely thrown the ‘stationery is for girls’ thing out the window and have plenty of fun ranges that will suit any teenager, actually they would suit anyone (I want one of every range) My current favourites are the ‘How to…For the Inept’ range which have very (un)helpful instructions for things such as surviving a zombie apocolypse. I am always trying to sneak fun yet slightly educational items into the gift piles at Christmas. This lens set is so cool that it can barely be classed as anything other than just great fun. The Olloclip turns a normal iphone camera into a digital microscope or loupe (I had to google this one; a loupe is a small magnifying glass used by jewelers or watchmakers). The 7x, 14x and 21x macro lenses lets you see very detailed closeups, nearly 100 times more magnification when combined with the iphone’s digital zoom. My girls love their music, as do the majority of teenagers. These colourful little speakers mean that they can share the music from their phones with each other wherever they are. The handle of the espresso cup is also a carabiner clip so it can be clipped to clothing or bags without any worry of losing it. Don’t be put off by the size either, the sound level is suprisingly loud considering how small it is! So there you have it, 6 fantastic gifts for teenagers that they would actually use and love to have, actually I might add some to my own letter to Santa, I hope it’s not too late! Disclaimer, I was provided with some of the items in this list to review, these were items I chose myself and wanted to add to my gift guide.